Captive breeding has been suggested as a method of conservation for many vertebrates, and is increasingly being proposed as a strategy for invertebrates. 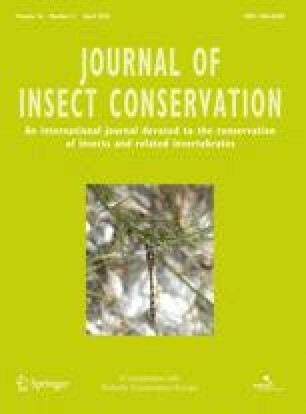 In this study, the growth, development and fertility of adults of the vulnerable cerambycid Morimus funereus reared in captivity are examined. Two oviposition cycles; from May to September and from January to March were studied and larvae from wild adults and from the progeny of captive adults (second generation larvae) were examined. Five to 12 instars were observed during larval development. Larval development was completed in 218 days (average) for the progeny of wild adults with an average mortality rate of 10.3% and in 226 days (average) for larvae from captive adults with mortality rate of 34.9%. First generation larval body weights were disparate during development, while second generation larvae had similar weights with no significant differences. In this study we have tested the potential of captive breaded M. funereus larvae as a model for investigation of digestive enzymes. Amylase from the midgut of larvae reared under laboratory conditions showed twofold higher specific activities with a decreased number of isoforms expressed, as compared to the enzyme from field-collected larvae. Captive breeding of M. funereus can be used in the future as a part of an effective conservation strategy for this rare insect species. This study was supported by a grant from the Serbian Ministry of Science and Technological Development (project grant number 172048). We are very grateful to Dejan Stojanović and National Park “Fruška Gora” for their kind assistance by collection of M. funereus field adults used in these experiments. We are grateful to Jasna Bojčevski and Tim Shreeve for help in translating our English.